Post-transplant lymphoproliferative disease (PTLD) is a serious complication of solid organ transplantation. As early diagnosis remains challenging, we investigated the utility of serum-free light chain (FLC) and heavy chain/light chain pairs (HLC) as diagnostic biomarkers. 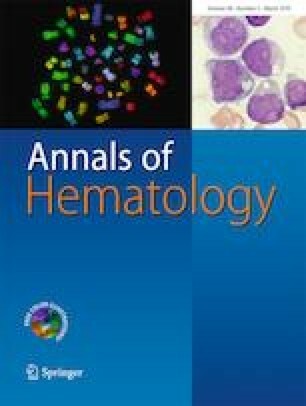 Pre-treatment serum FLC and HLC levels were measured in 20 patients at their first diagnosis of B cell PTLD and in 14/20 patients during follow-up. Results were compared to serum FLC/HLC levels of 90 matched PTLD-free transplanted controls. Renal dysfunction was common in both cohorts, and combined FLC levels were often elevated above the conventional upper limit of normal (45.7 mg/L). Combined FLC levels were higher in patients with PTLD than in transplant controls (p = 0.013), and levels above the conventional ULN were associated with PTLD (OR 3.2, p = 0.05). Following adjustment to cystatin C as a marker of renal function an even stronger association was found for a (dimensionless) threshold value of 37.8 (OR 8.9, p < 0.001). In addition, monoclonal proliferation (abnormal FLC ratio, using an established renal range cutoff) was more common in PTLD than in controls (3/20 vs. 2/90, p = 0.04). Following therapy, at the time of protocolised restaging, patients experiencing subsequent sustained complete remission displayed lower FLC levels than those not experiencing such remission (p = 0.053). No relationship with HLC results was seen. Elevated polyclonal FLC levels (especially when adjusted for renal function) and monoclonal proliferation are a potential biomarker for PTLD diagnosis and disease surveillance. However, prospective validation is necessary before FLC measurement should be incorporated in follow-up of transplant recipients and PTLD management. We thank the Binding Site Ltd. for the provision of the assays for this study and for technical support, in particular, Dr. Anne Burmeister. RB and RUT are the principal investigators, coordinated the research and take primary responsibility for the paper. HZ, HR and RUT recruited the patients and collected clinical data. FB, RB and PC recruited the controls. AS did the laboratory work. AS, RB, PC and RUT analysed and interpreted the data. IA served as reference pathologists. AS, RB, PC, HZ and RUT wrote the paper. All authors had full access to the final version of the manuscript and agreed to publication. Ethical approval for this study was provided by the local committees of both institutions. The study was conducted according to the guidelines of the Declaration of Helsinki. The Binding Site provided FLC, HLC and cystatin C assays free of charge. The Binding Site played no role in the analysis of the clinical data, its interpretation or the manuscript preparation. The content of the manuscript remains the responsibility of the listed authors.